Sergiev Posad is an excellent destination for a day trip from Moscow as it is very easy to get to, even if you speak no Russian, and is home to one of the most revered monasteries in Russia – the UNESCO-protected Troitse-Sergeiva Lavra. Sergiev Posad is the only city in the Moscow Region to be officially included on the Golden Ring route. It is very close to Moscow and there are many trains (long-distance, express and suburban) and buses which connect Sergiev Posad with the capital. The quickest way to get to Sergiev Posad is via the express train to Aleksandrov which takes about 1 hour. The train only stops in Sergiev Posad for one minute, so make sure you are ready to get off. You can also get a standard suburban train to Sergiev Posad which run frequently and take around 1½ hours. Both the express train and the suburban trains leave from Moscow’s Yaroslavsky Railway Station. Tickets for the express train should be bought in advance as if for a long-distance train. Tickets for the suburban trains can be bought on the day of travel from the suburban ticket desks or from an automatic ticket machine. It is also possible to get to Sergiev Posad by bus. Bus No. 388 leaves from just outside VDNKh metro station around every 15 to 20 minutes. It should take just over an hour to get to Sergiev Posad in good traffic. 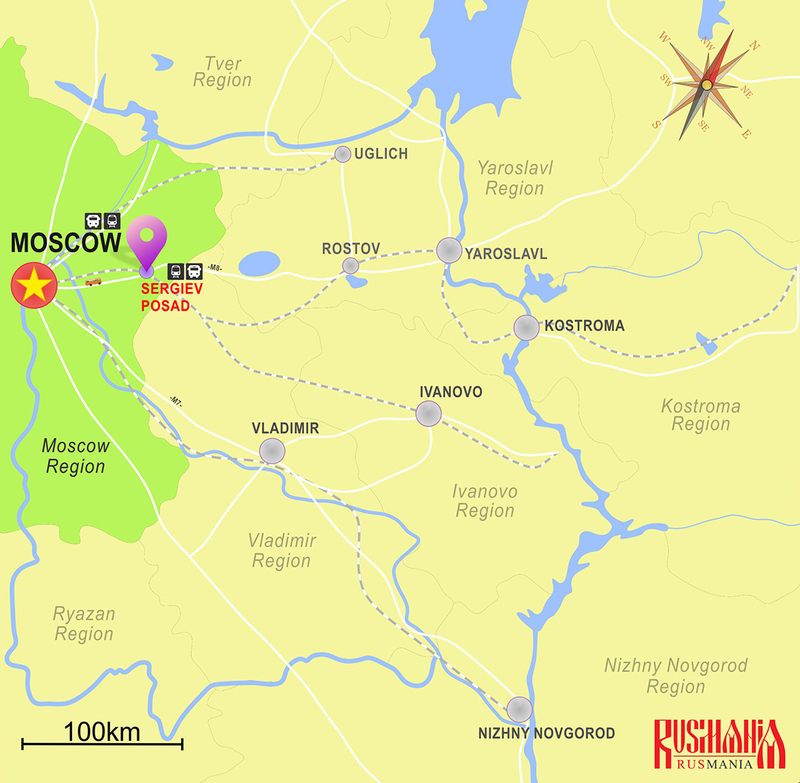 However the route there is via Yaroslavskoe Shosse which is known for its traffic jams. The buses arrive at the bus station next to Sergiev Posad Railway Station. Tickets back to Moscow can be bought in the kiosk outside the shopping centre. The main sight in the city is of course the Troitse-Sergieva Lavra which is located around a kilometre from the railway station. To get there you need to walk to Ulitsa Voznesenskaya which runs parallel with the road outside the railway station. Walk up Ulitsa Voznesenskaya in the same direction as the train was heading until you get to a viewing platform from where you can get great photos of the monastery. More information about Sergiev Posad can be found on our Sergiev Posad pages. On the square outside the monastery there is usually a souvenir market selling the traditional range of Russian souvenirs, as well as icons especially ones of St Sergius of Radonezh. You can also buy water bottles here to fill up with holy water from the monastery.